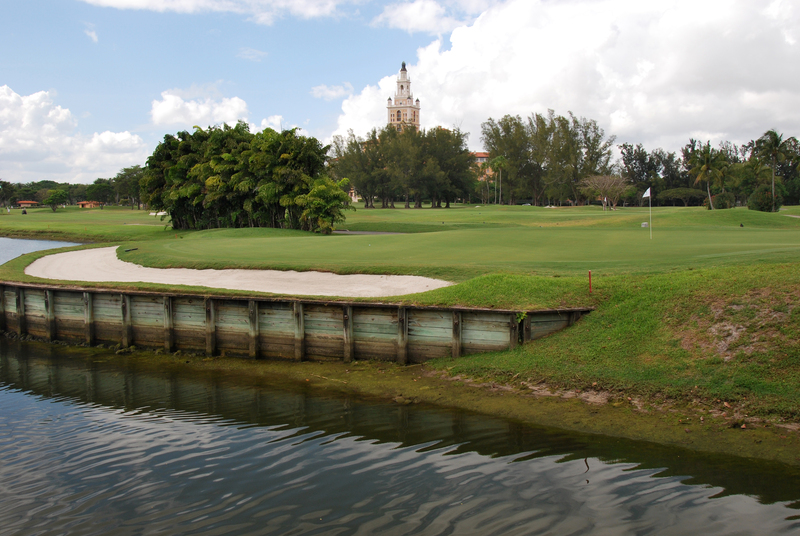 The list of golf courses in Miami always begins with Doral, and deservedly so. But since the thought of giving any of my hard-earned dollars to Donald Trump makes me want to puke, I looked elsewhere. Turns out there are a lot of interesting golf courses in this area, but who am I to resist a Donald Ross design? I actually had never played any of his many masterpieces so it worked out perfectly. I showed up at The Biltmore an hour before my tee time on two hours of sleep after a red-eye flight out of the desert, so I was a little out of it before the round. I’m surprised I even found the course. But I’m glad I did. It’s actually not too hard to spot. The resort features a soaring, Spanish-looking tower that is visible for miles around. I could see it from our Miami office a few miles north when I was working a couple days later. 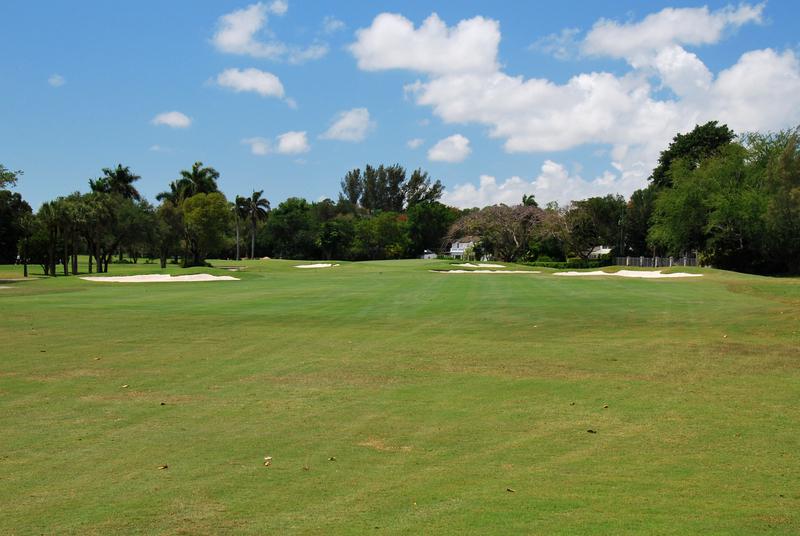 At half the price of Doral, you get all the enjoyment and plenty of history to experience. The Biltmore’s guest list includes names like Al Capone, Babe Ruth and Franklin Roosevelt. During and after World War II it wasn’t even a resort, it served as a veteran’s hospital. Not a bad place to recover. I did think there’d be more wildlife. Well, by wildlife I mean gators. I did not see any alligators, I’m told they do exist here though. Apparently when they get too big they’re bagged and relocated to the Everglades. Also at The Biltmore are dozens of iguanas, turtles and a flock of tropical birds that actually migrated here after escaping the Miami Zoo when the roof failed during Hurricane Andrew in 1992. I’ll take parrots over crows any day, especially so close to Margaritaville. The course begins with a dogleg. This will be a recurring theme throughout the day. Many of these doglegs occur before or right at the landing spot, so there are choices to be made on nearly every tee. 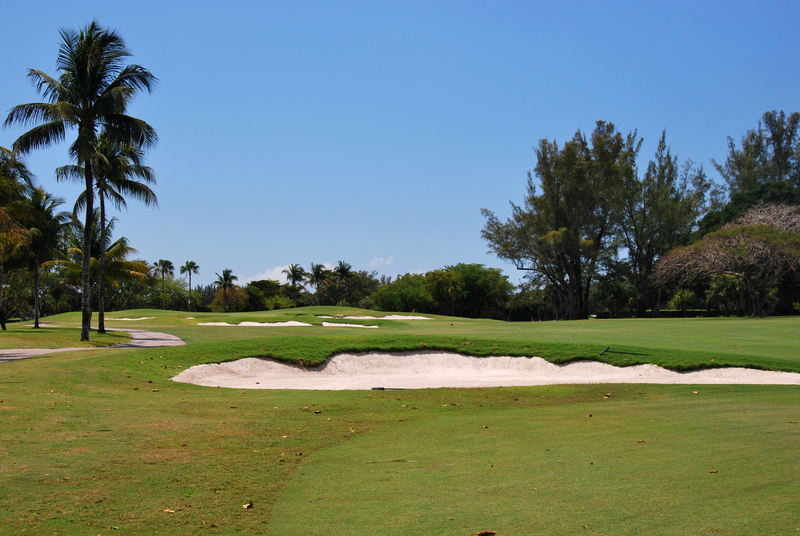 Most involve carrying a bunker, avoiding trees, hitting a narrow patch of fairway or some combination of all three. The first of these is the dogleg-right, 488-yard par-5 opening hole. From the fairway it’s actually reachable to a green that slopes off the back. The easiest par 3 is the 2nd, at 162 yards and with no real danger. The third shows that even on the relatively straight holes, you can take different routes. There is a line that can bite off a big chunk of the 368-yard par 4, but a short tee shot to the right side of the hole in the fairway is the safest route. It really is a cool hole with the column of sand traps along the left leading to the green. The par-4 4th, at 341 yards is almost like the second shot of a par 5. It’s just long enough to be unreachable, but short enough to where you can play the hole backwards and pick which length you want on the approach and go from there. The dogleg-right par-4 5th is one of the trickiest. All those dangers I mentioned earlier are factors here, with a big, steep fairway bunker, a narrow fairway and dense trees. The 395-yard 6th is almost just a longer version of the 4th. The hardest hole on the front nine would be the 370-yard par-4 7th. There is a big creek cutting through the fairway that requires a good shot to carry. From that side of the creek, the hole plays nice and short. Bail out to the right and you’re looking at 170 to 200 yards left. I just aimed over the shack on the left and fired away. The 200-yard 8th plays to a very deep green that can make the distance play any of four clubs from the tee, and there are tough bunkers and chipping areas as well. Then you can follow the iguanas across the bridge to the 9th. The back nine is the tougher and more exciting side here at the Biltmore. The doglegs feel meaner, sharper and narrower. The water comes into play more often and these trees contain a lot more branches. Or maybe it was me having not slept on the red-eye and finally hitting the wall on this humid day hoofing it around the course while closing with a 46. Well it’s not the worst excuse I’ve ever made. The trees really wall off the left side of the 356-yard 10th, but a short shot into the fairway leaves the best approach to a shallow green. The 11th is long and dotted with the blindingly white sand of the Biltmore’s bunkers (I should’ve packed a pair of sunglasses). The 178-yard 12th is over a creek, but is only as difficult as the pin placement. 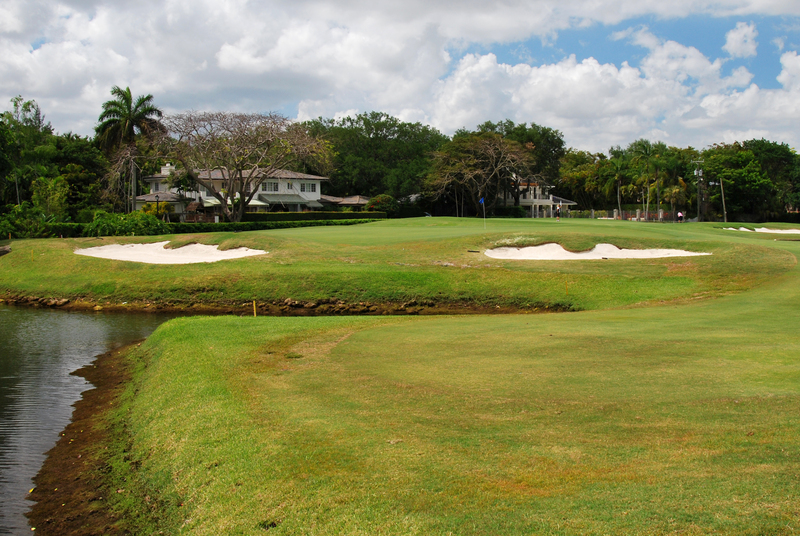 Anything in the center is easy, but the sides are both guarded by sand traps to the front. While longer than it looks off the tee, it doesn’t appear to have too much teeth, unless you spot the gator swimming around. Ahh the 13th, the longest par 4 from the blue tees, and also the site of my 11. It’s actually one of the gentler doglegs on the course, easing to the left, but there is a tough sand trap and a narrow entrance to the green. The short 14th is a cool hole, with a wall of ferns and palms behind the green that adds a stadium feel and an air of privacy on an otherwise open course. 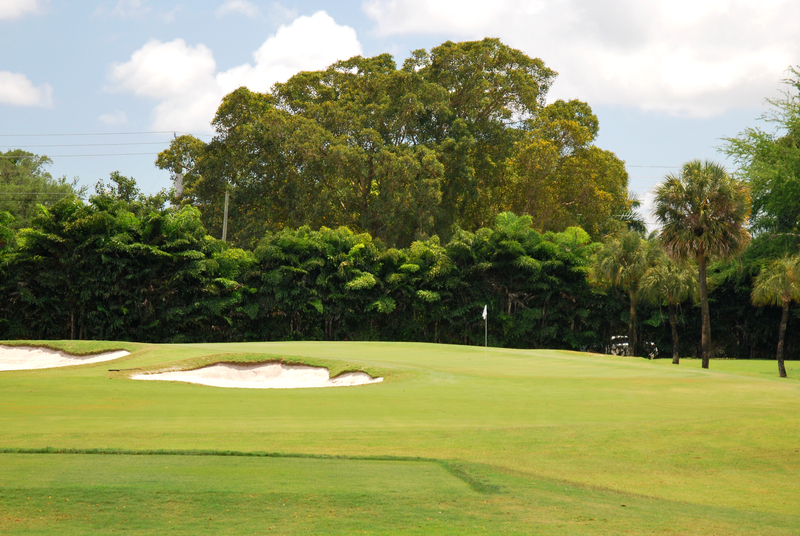 The sloping green is tricky and guarded by two large traps. The long, 519-yard 15th is a definite three-shot hole. Any tee shot in the grass is fine, but you’ll have to layup because of a creek about 80 yards or so from the green. Best not to mess around with the murky waters of south Florida. At 363 yards, the 16th is the last of the easy par 4s. Any tee shot over the left fairway bunker should be fine. The prettiest hole on the course is also completely different than any other at the Biltmore. The 393-yard 17th plays long and into the wind. Well, mostly. The wind really seemed to change directions a lot here as it swirled around the complex. The approach shot at 17 is the most fun, with a lot of water to carry that extends from in front to the right side. Carry that and you still have to carry a skinny greenside bunker that follows the water. Do all that and then you have to land on the right tier of the green or three putts is all but guaranteed. After spending 16 holes idling at a pretty easy pace, the 17th kicks things into high gear with this beast. The short, par-5 finishing hole is a classic. It doglegs to the left and with the right line is easily reachable in two. 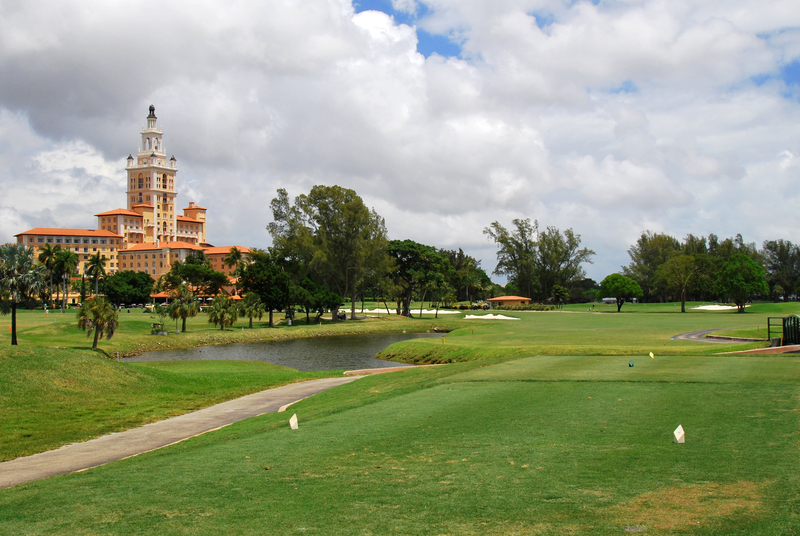 With large palms and the beautiful orange tones of the tower off to the right, it’s the perfect way to finish a great round of south Florida golf. 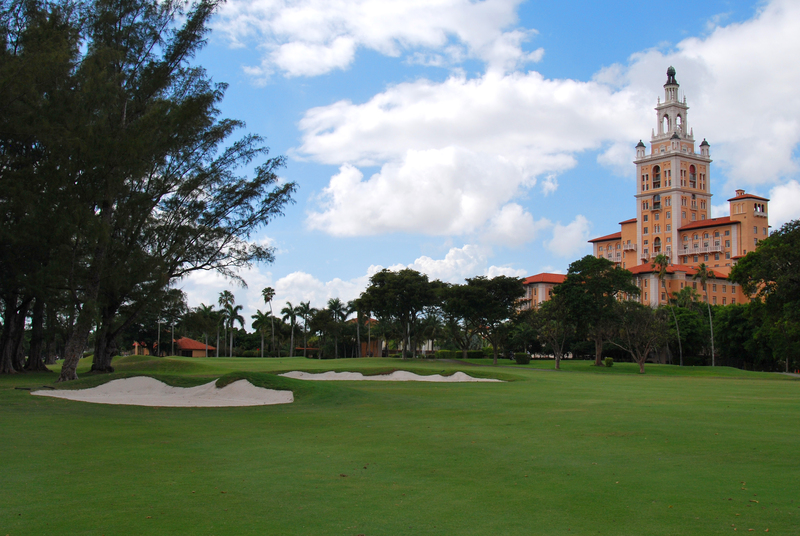 If you get the chance, the Biltmore is a definite must-play. Fortunately, the course participates in the Golfnow program so discount tee times are available. It is a great example of how a layout designed in the days of radio can still be a challenge today. Distance isn’t required, in fact you probably could forget your woods at home and still have a good day. It’s creativity on the greens that’s required, with different looks on each hole and fun bunkers to play out of should you find yourself trapped in one. I could play this course a dozen more times and still enjoy it. That’s the beauty of these old designs by the great architects, they never go stale. 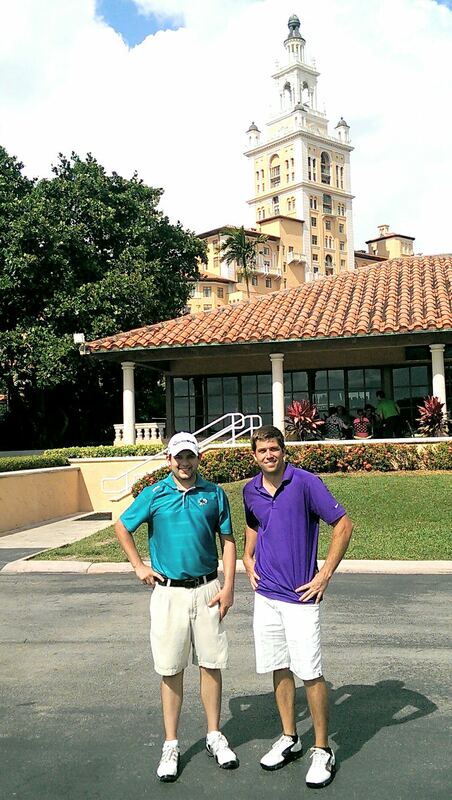 The round was definitely better being paired with Tyler, a Miami MBA student just out of the military who has a membership here. He definitely helped me navigate the course. He also convinced me to walk however, which was a brutal decision. He’s a great kid, so if you’re a Biltmore employee reading this, you should definitely take care of him. And the pace of play is pretty swift, so you have all afternoon to meander South Beach and take in the view, good, bad or ugly. From tee-to-green the final hole of the front nine is the prettiest. 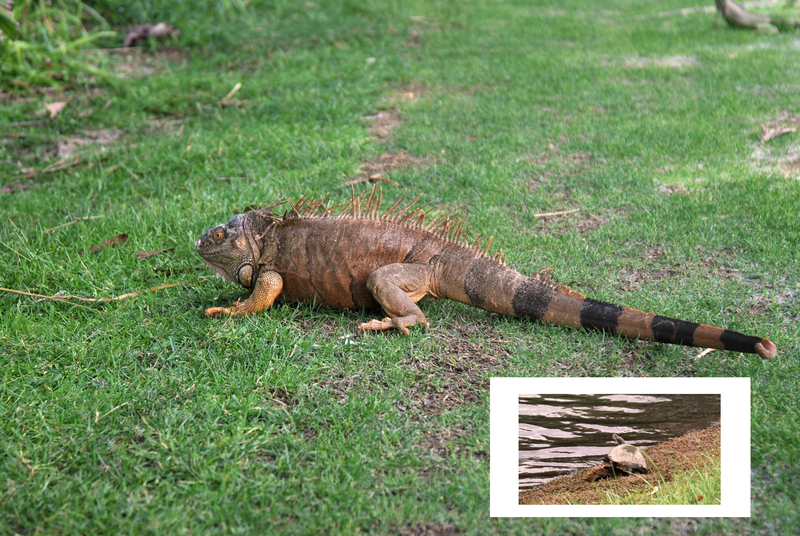 Walking across the bridge I was greeted by about a dozen iguanas before standing on the tee box. From there the view is as nice as there is at the Biltmore. The water that factored into #7 frames the hole on the left before slipping under the fairway and posing no threat. Take a sure club and get it in the fairway to your favorite distance. From the middle of the short grass is the best view. The high-lipped, curvy bunkers provide a perfect frame to the elevated green, one of the largest on the course. It seems like this green might even be the course’s highest point. That’s all relative considering that the state of Florida’s high point soars into the heavens at just 345 feet above sea level. I actually took my time walking this hole, not because I was getting sluggish in the high-80s humidity, but because I enjoyed taking in the surroundings so much. It’s so nice I’ll post two pictures. Amenities: A; being adjacent to the resort there is plenty going on, and all the practice areas are there along with a stocked pro shop and nice restaurant. Difficulty: C+; as interesting as the design is, this course would be much easier the second or third time out when you learn to avoid the trees. 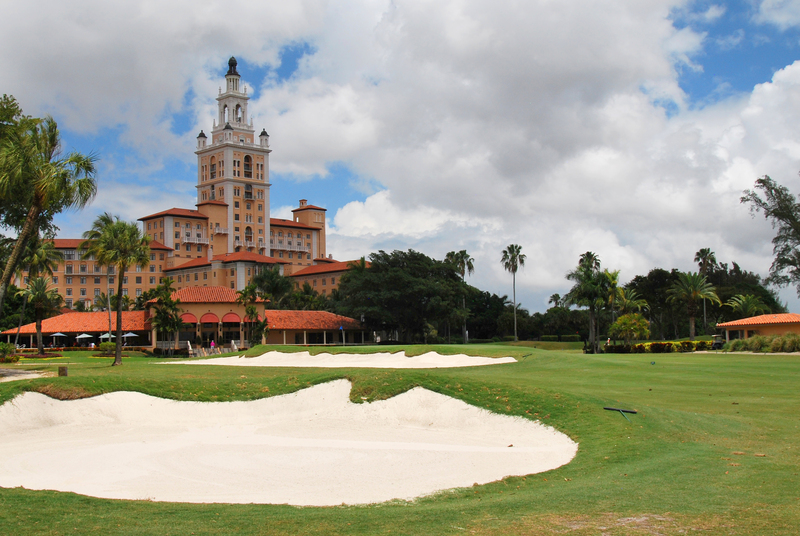 Scenery: B; the big tower at the Biltmore Hotel looms over the entire course, which is both a cool characteristic and makes you feel like you’re being watched at all times. Value: C; as one of the more expensive courses in south Florida at $229 for non-residents, it is on the high side and borderline not worth it. I found a Golfnow rate for $59 and jumped on it, it’s a bargain at that price. Overall GPA: 3.05 (B); the Biltmore is definitely one of the coolest old-school courses I’ve been to, the layout is always interesting, it makes for an easy and enjoyable walk and has a great atmosphere that feels like stepping back in time a few decades.